The summer already feels like a lifetime ago right now which provides me with the ideal excuse to cast our minds back once more to August bank holiday. 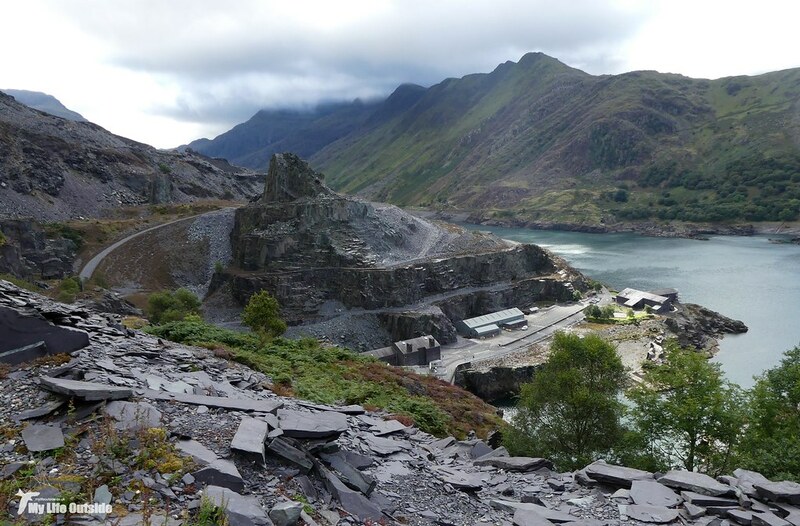 Regular readers may recall that we spent most of it crawling over the remains of Dinorwic slate quarry near Llanberis, the world’s second largest such enterprise and a place which captivated me from the start. Abandoned inclines, winding houses, tramways and much more besides, evidence of an industry now very much on its last legs and for some almost entirely forgotten. At the time I remember remarking on how you could almost imagine the place as it was, packed with men and boys alike all working hard to dig deep into the vertical seam which lies just beneath the surface there. Reminders of those people though are scarce, restricted to occasional finds such as an old mess tray, pair of trousers or unknown names scratched into flaking mortar. There is however one location where it’s possible to get a lot closer to the human factors at work here and finding it was our main aim of a second day spent amongst the tips. 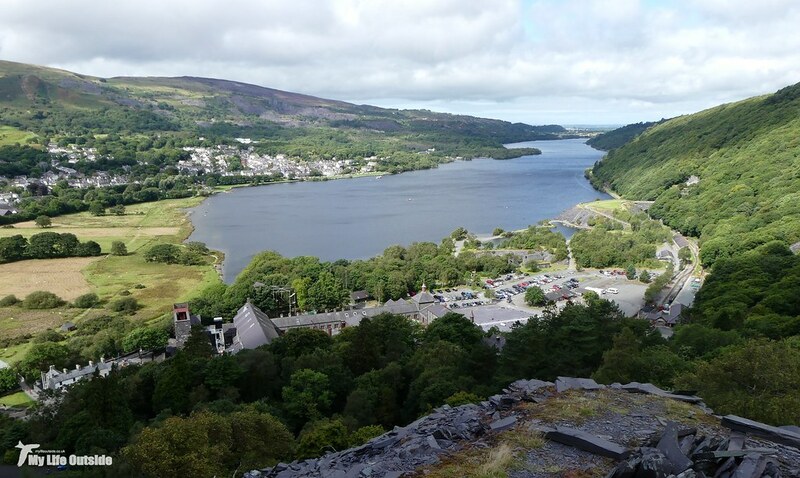 We started our venture in Padarn country park, home of the National Slate Museum and a host of restored artefacts including inclines, workshops and aerial ropeways. Climbing one of the former saw us gaining height rapidly through dense woodland only to emerge into daylight with stunning views stretching down across Llanberis. Behind us the curving route of one of the old tramways encouraged us onwards, its bed awash with colour thanks to a thick blanket of Heather. The contrast between austere slate walls and sunlit vegetation was stark but it’s precisely because of this dichotomy that I love these places so much. If my camera battery hadn’t been running so low thanks to a weekend away from power then I’d probably have taken another deluge of images from this area alone. Following its route we were soon looking across to the main levels, their regimented uniformity broken by occasional gunpowder stores and other structures whose purpose was less clear. We continued climbing for a brief period passing the local Mountain Goat herd from the previous day before arriving at a wide step in the hillside which dropped off a precipice to the tips below. Here the ruins were distinctly more residential in style, small rows of cottages with what looked like yards and perhaps even pigsties attached to some. 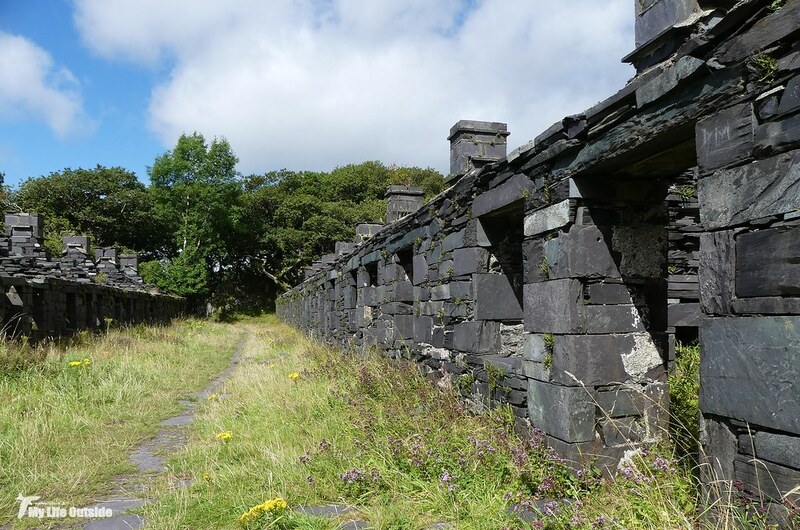 Most were in a state of disrepair however which is why we were so keen to find the Anglesey Barracks. 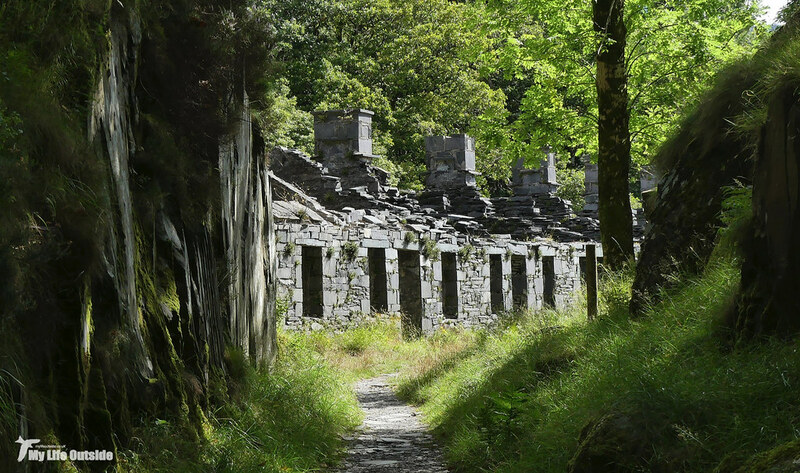 This double row of cottages is so called because they once housed workers from the island of Anglesey who, unlike the local population, required lodgings during the week. The men typically left home on a Monday morning and went back the other way on Saturday afternoon, intervening time spent in these twenty two one bedroom houses built allegedly to house four men apiece. With no amenities and only a small fire for warmth life would have been harsh, particularly during winter, which undoubtedly led to the buildings ultimate condemnation as unfit for human habitation in 1948. On a warm summer’s day however that hardship doesn’t seem too great with dramatic views across to Snowdon and a delightful sun dappled path stretched between the rows. 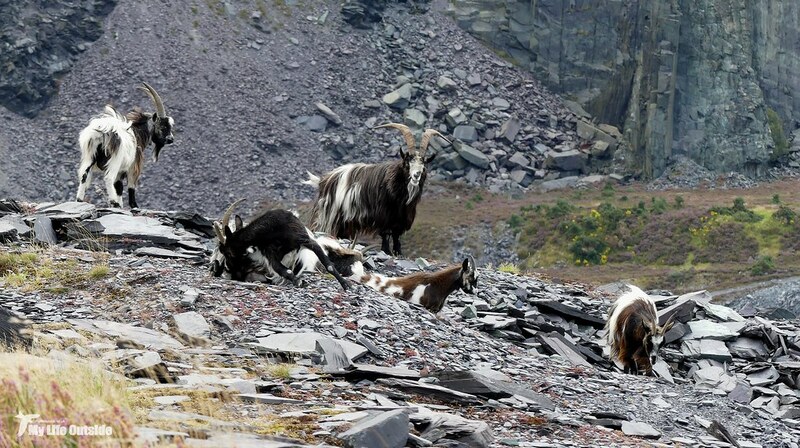 Even after all we’d seen, Dinorwic still had one last surprise in store. 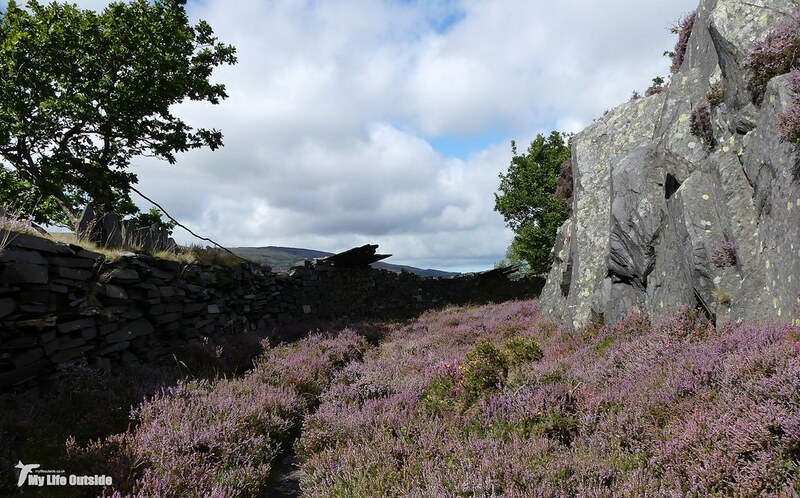 Our return route took us down a path measuring no more than a metre across, each side lined by a continuous head height slate wall behind which rested thousands of tonnes of slate waste on our right and a perilous drop to our left. As we zig-zagged our way downwards the feeling of being trapped increased but I couldn’t help but marvel at the sheer audacity of what we were walking on. Generations of miners would have passed this way over the years, adding more slate to these tips which they’d then have to negotiate on the way back down. And that for me has always been the biggest conundrum of the slate industry. 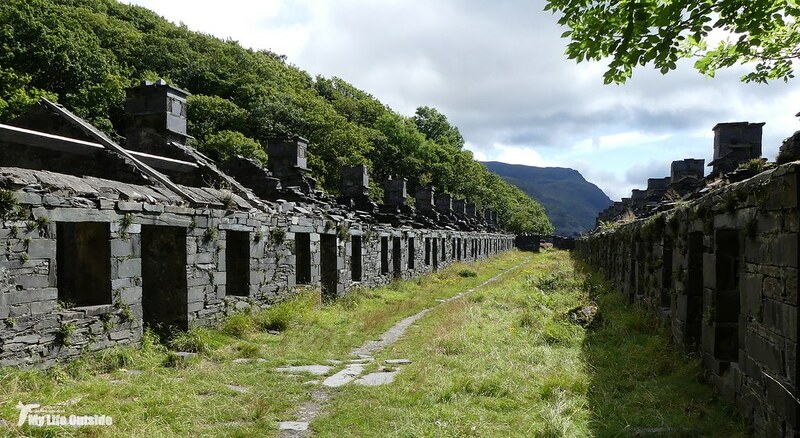 With a typical yield of one tonne useable to thirty tonnes waste there was a hell of a lot of material to manage and the structures used to do just that are almost, if not more impressive than the buildings to which the good slate went. Take this path as a fine example. 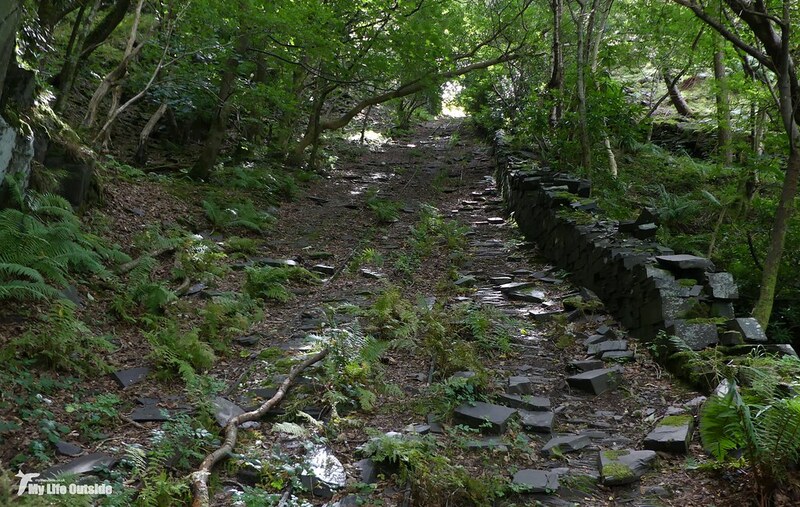 Miles of wall, hundreds of steps and all to negotiate an obstacle which had been created by the quarry itself. Other examples include the huge retaining walls seen elsewhere at Dinorwic not to mention the continuous realignment of tramways, supporting infrastructure and even whole villages. That such efforts still left a profit show the sheer value of slate at the time, but also probably shortened the industry’s life by several years when the end ultimately came.